Valentine’s Day in the Bay Area doesn’t have to be just another holiday. So, guys and girls waiting for the love of your life? Here’s the month of February you are waiting for. Feb may be the shortest month of the year but let’s not forget its the month when the love is in the air. 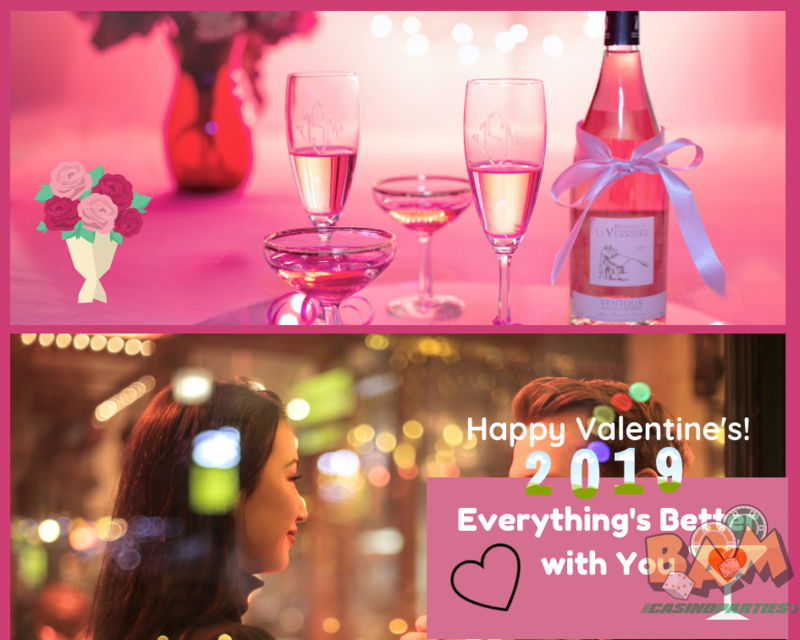 Find the perfect getaway, parties or romantic dinner with your special someone on this Valentine’s Day 2019 in bay area. Enjoy sensational and exceptional lovable evenings with a great gaming experience in BAM casino parties where you and your partner can have fun all night. 14th Feb 2019, the most awaited one for the couples is mere three weeks away. If you don’t have any idea about how you can spend your evening it’s time to start for the plan. Start thinking now, what are you waiting for? BAM Casino parties is one of the best destination for having all the fun filled evenings in San Francisco, Bay Area with the tinge of awesome casino games . Treat your special one with love. Date the romantic evenings with that one love of your life. Enjoy all the casino games including blackjack, poker, craps, roulette and lots more. Keeps your heartbeat up and add an extra spice for your Valentines day with the help of BAM Casino parties. Gifting cards, teddies, bouquets is no doubt the best you can do to please your special ones. Why only stick with the old ideas when we can help you plan the entire evenings. At Bam Casino parties, you can have the best casino gaming ideas to surprise everyone. Create memories for the future because who knows what is planned for the coming time. Let your child be out and meet up the depth of gaming in the most possible, heartfelt and welcoming manner. Nevertheless, a perfect evening is incomplete without games and fun. So, our professionals can help you with everything as per your budget and the way you want at your desired places. We provide casino rental equipment as well that includes gaming tables, professionals to teach you at your place. Wanna be a member of the league and want your partner to enjoy with you. Get crazy, mad and pull your socks to have fun filled Valentine’s bash. You might feel that we may be crazy as we are trying to let your Valentine’s evening be spent at the casino. Spending Valentine’s day with casino games may seem like one of the out of the box choices but there’s nothing that gets your blood pumping like a thrill of playing high stakes poker, roulette or other games. And surely there’s no if and but in that case if you win the games, that’s just a cherry on one of those romantic days. So, be sure to check out party rentals for your special Valentine’s. If you really feel that you have to move all the way to Vegas for enjoying the thrill of gambling, then just think once again. BAM Casino parties is one of the best SF Bay Area Valentines Day Event organisers that offers casino rental equipments, casino games such as Roulette \ Craps \ Blackjack with as much excitement as anything that you may find on your Vegas trip.